A quick view of the most influential metrics in Elmhurst. 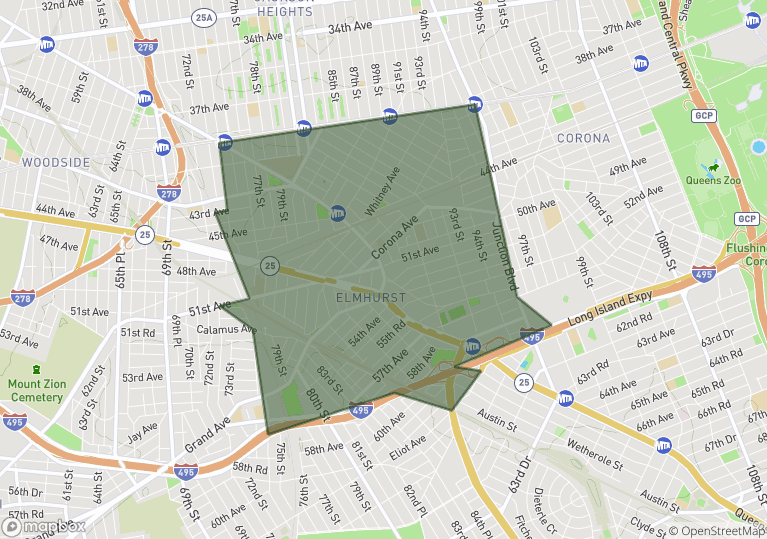 Elmhurst is a densely populated urban neighborhood located in the borough of Queens. It is college student friendly, highly walkable and safer than the average community. It is extremely diverse in terms of ethnicity and race. Nearly 60% of all residents have Asian ancestry and 16% of all residents are of South American ancestry. Approximately 66% of all residents were born in other countries. Spanish is the primary language in the neighborhood, followed by Chinese, English and Tagalog. The average household has 3.2 people. The neighborhood has a home vacancy rate of 8.4 %, meaning that there are a number of options when it comes to picking your new home in the cozy neighborhood of Elmhurst. The village that would one day become Elmhurst, began in 1652 and was established by the Dutch with the name Middenburgh. When the British took control of the area in 1664, they renamed the village New Town, which as later simplified to Newton. Development in the area took off when a horse car line was established in 1854. Then, in 1876, the long Island Rail Road built their main line through Elmhurst. The neighborhood flourished becoming fashionable due to a housing development built by the Cord Meyer Development Company in the late 1800s and early 1900s. Over the years, the neighborhood has grown and developed into one of the most diverse neighborhoods in the city. Notable residents include, jazz musician Mose Allison, singer Henry Belafonte, actress Patty Duke, actor Carol O'Conner and the founder of Elmhurst John Moore. Elmhurst spans 1.971 square miles and it has a mixed workforce/job market with white and blue collar people and positions. It is a middle-income/middle-class community when compared to state and national economic standards. In 2010, the population was 88,427 and the population density was 75,000 people per square mile. In 2015, the median household income was $52,369 and the median rent was $1,362. Also, in 2015, the average estimated value of detached homes in the neighborhood was $692,245 and the average estimated value of townhomes and other attached housing was $768,690. Playground, Robert W Trombino Overlook Park, Veterans Grove Park, Horsebrook Island and the Libra Triangle. Housing in the neighborhood is primarily small to medium sized apartments, in small apartment buildings, complexes and high-rise units. Housing consists of duplexes, three-deckers, and Victorian homes converted into apartments. The majority of residences were built previous to 1940 and 1960. However, there are also a number of houses that were built before 1940. Homes for sale are more rare in this neighborhood, but the houses do come in a variety of styles and colors. Other real estate options include apartments, townhomes, condominiums for rent, sale or lease. Call local real estate agent Ed McNulty at 516-887-3603 and let him help you find your new home. View our selection of available properties in the Elmhurst area. Check out the latest demographic information available for Elmhurst. Learn more about schools near Elmhurst complete with ratings and contact information. Browse through the top rated businesses in the most popular categories Elmhurst has to offer.